You probably know Vibram from those Five Finger barefoot shoes. But their bread and butter is actually developing the best shoe soles on the market and integrating them onto the products of many of the biggest shoe brands. 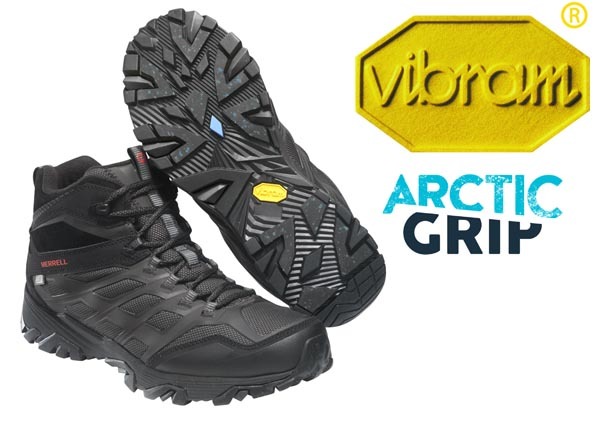 Vibram just announced a breakthrough new sole called Arctic Grip, that promises to change winter footwear. Arctic Grip will provide much better grip on slick, wet ice than current rubber soles. The material has thermocromatic properties that will sense when the temperature drops below 32 degrees Fahrenheit, and change color. Vibram will be working exclusively with Wolverine Worldwide brands (Merrell, Sperry, Hush Puppies, Wolverine, Saucony, Wolverine and Cat Footwear), with products debutting for the Fall 2016 lines. Artic Grip soles will be available across a full range of models, from technical shoes all the way to lifestyle models.